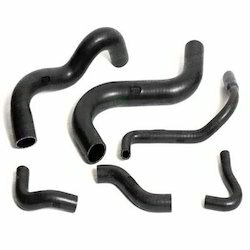 Manufacturer of a wide range of products which include radiator hose. With our vast experience in this domain, we have enabled us to serve our clients with a broad array of Radiator Hose. The hose is made available in various specifications to comprehend the varied needs of our prestigious clients. In addition to this, this hose is designed and manufactured using the finest quality raw material and advanced machines in adherence with set industry standards. The offered hose is available with us at affordable price. This has wide application in Diesel & Petrol vehicles, engines & machineries etc. Lining Natural / Synthetic / Blend rubber compound. Reinforcement Braiding of natural/synthetic fibre or plies of both side rubber coated woven textiles. Cover Natural/Synthetic/Blend rubber compound with cloth marked finish.